This machine is an enhancement over version 1.2 including features for enhanced rigidity and accuracy. 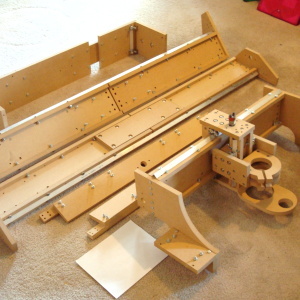 As with the version 1.2, this is an expandable (modular) CNC kit with a 2'x4' routing area. This is the first ever modular CNC machine. 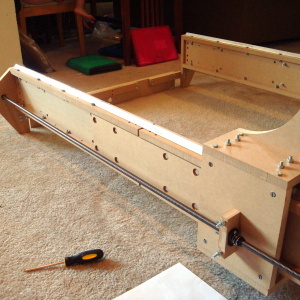 This CNC Router kit will have the ability to be expanded from 2'x4' to 4'x8' (Routable Area!) with the purchase of the expansion kit. Also available is a standard 2'x4' routable area CNC kit but with the new design. The router is not included and international shipping will be based on the couriers price. The electronics and motion kit include stepper motors, driver electronics and power supply. The ratings and voltages of the electronics may change from those stated in the electronics combo. 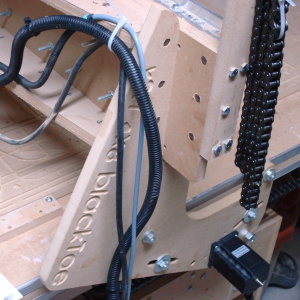 With this CNC, you will be able to use one or two lead screws for the x-axis. Therefore, you may need an extra motor and driver. This added lead screw option will provide much better accuracy at high velocities. You will also notice a very important enhancement that will allow a main table cutting surface to be connected right to the I-beams for enhanced rigidity. This is possible with the modified x-axis supports perpendicular to the bearing supports. They don't connect all the way down to the gantry bottom allowing no obstruction to a table connected to the sides. 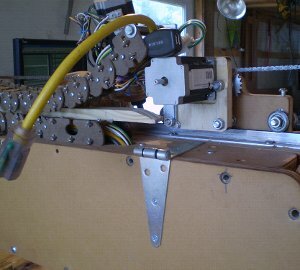 Other features that you will see in this machine will be the dual rails on each side of the x-axis. That's a total of 16 points of contact ensuring very sturdy and steady movements. At the expandable measurements of which this machine will be capable, the dual rail and the reinforcements coupled with the 1.3 enhancements will be a great benefit and enhancement for rigidity especially at the 4'x8' size. Other features include, expandability and configurability; shifting of the bit center to enhance the routing area; better method of securing the rail; and the wonderful smell of freshly cut wood and lots of holes (have you seen so many holes?!?). Below are the options and prices. To purchase the expandable up to 4'x8', you first must purchase the 2'x4' base unit. Lead screws are sold separately as there are many variations. For high mechanical precision, 1/2"-10 ACME single start would be a good selection. For a balance of precision and speed at 100-150 IPM, choose 1/2"-8 2 start lead screws that provide 4 turns per linear inch. To get the highest velocity, I would recommend 1/2"-10 5 start lead screws that provide 2 turns per linear inch of movement. These option include wear compensating nuts and two clamps per axis. This Machine was depreciated for the Version 2.0 blacktoe. The movie below simply shows what a CNC machine does for curious viewers. It does not exhibit the version 1.3 kit. 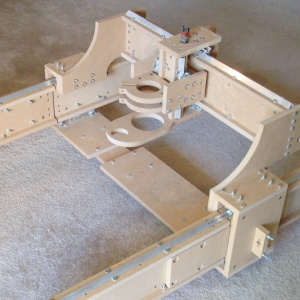 Update: Here are the CAM (.nc) files for the CNC router kit model seen on this page. There are a total of five boards. Each board measures 2'x4' with a 1" clear border to maintain structure while routing. The origin for these layouts is positioned at the lower left corner. The z-axis is positioned where the tip of the end mill meets the surface of the material to enable easy cutting with a flat end 1/4" end mill (upcut 2 flute), the depth per pass is set at .17". Click on each of the board images to download the respective .nc file. In this section, I will list feedback and user's experience with this kit. Since his full name is in his blog, you won't need to guess his last name. 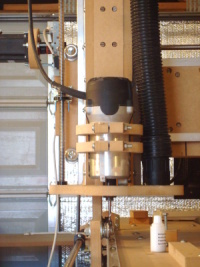 Andy writes about this CNC in his blog. He did a fine job assembling his CNC machine, and he gratously explains a little about CNC machines and robots, in an amusing comparison/contrast. Check out his beautiful weblog at: blog.andymcelfresh.com. I envy his photographic abilities!